Restrictions on religion around the world continued to climb in 2016, according to Pew Research Center’s ninth annual study of global restrictions on religion. This marks the second year in a row of increases in the overall level of restrictions imposed either by governments or by private actors (groups and individuals) in the 198 countries examined in the study. The share of countries with “high” or “very high” levels of government restrictions – that is, laws, policies and actions by officials that restrict religious beliefs and practices – rose from 25% in 2015 to 28% in 2016. 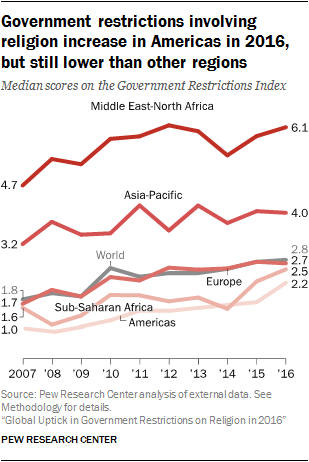 This is the largest percentage of countries to have high or very high levels of government restrictions since 2013, and falls just below the 10-year peak of 29% in 2012. Meanwhile, the share of countries with “high” or “very high” levels of social hostilities involving religion – that is, acts of religious hostility by private individuals, organizations or groups in society – remained stable in 2016 at 27%. 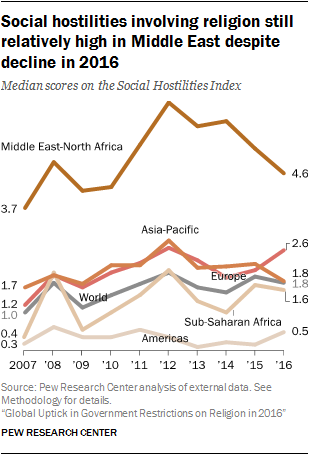 Like government restrictions, social hostilities also peaked in 2012, particularly in the Middle East-North Africa region, which was still feeling the effects of the 2011 Arab Spring uprisings. The number of countries with high or very high levels of social hostilities declined in 2013 and has remained at about the same level since, but it is higher than it was during the baseline year of this study (2007). At the same time, most countries in the world continued to have low to moderate levels of religious restrictions. Looking separately at the global median scores on the Government Restrictions Index (a 10-point scale based on 20 indicators of government restrictions on religion) and the Social Hostilities Index (a 10-point scale based on 13 measures of social hostilities involving religion) offers a mixed picture of how religious restrictions are changing. In 2016, the global median score on the Government Restrictions Index ticked upward, from 2.7 to 2.8, while the median score on the Social Hostilities Index fell slightly, from 2.0 to 1.8. Nationalist ideologies were not limited to governments. The number of countries where nongovernmental nationalist organizations (as opposed to governmental actors, such as officeholders or political parties with a role in government) targeted religious groups also increased in 2016. One of the 13 measures that comprise the Social Hostilities Index is whether any organized group or groups “sought to dominate public life with their perspective on religion” at the expense of other religious groups. Like the other SHI measures, the answer to this question has been coded annually for each country, based on the same set of publicly available sources (for more details, see the Methodology and SHI Question 7 in Appendix D). In 2016, the study found 77 countries where organized groups sought to dominate public life at the expense of certain religions, up from 72 countries in 2015. Not all of these groups were nationalist or espoused positions against immigrants and religious minorities, but the number of groups that did espouse these positions also rose, from 27 countries in 2015 to 32 in 2016. The majority of social groups displaying this kind of nationalist or anti-immigrant and anti-minority activity – 25 out of the 32 – were in European countries, including the United Kingdom, Ireland and Hungary. A few additional countries with these types of groups were in the Asia-Pacific region, including Sri Lanka, India and Australia. This type of activity was common among countries in this category: Religious minorities were often the targets of demonstrations, derogatory public comments or violent acts by nationalist groups. In all 32 countries where nationalist groups sought to dominate public life in 2016, they targeted religious minorities, such as Muslims, Jews, minority Christian churches or members of other faiths. 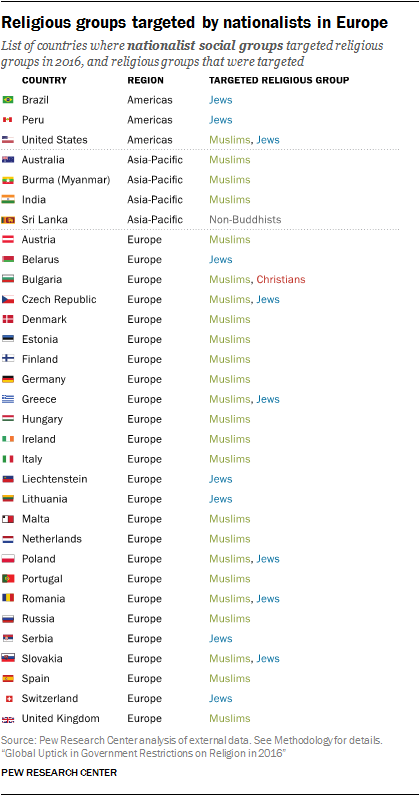 But while Muslims were the primary target of nationalist movements across the globe, Jews, Christians (including Jehovah’s Witnesses) and others were targeted as well. For example, in 2016 nationalist groups aimed activities against religious groups in three countries in the Americas – Brazil, Peru and the United States – and Jews were a target in all three; in addition, Muslims also were targeted in the U.S. This is the ninth in a series of reports by Pew Research Center analyzing the extent to which governments and societies around the world impinge on religious beliefs and practices. The studies are part of the Pew-Templeton Global Religious Futures project, which analyzes religious change and its impact on societies around the world. The project is jointly funded by The Pew Charitable Trusts and the John Templeton Foundation. To measure global restrictions on religion in 2016 – the most recent year for which data are available – the study ranks 198 countries and territories by their levels of government restrictions on religion and social hostilities involving religion. The new study is based on the same 10-point indexes used in the previous studies. The Government Restrictions Index measures government laws, policies and actions that restrict religious beliefs and practices. The GRI comprises 20 measures of restrictions, including efforts by government to ban particular faiths, prohibit conversion, limit preaching or give preferential treatment to one or more religious groups. The Social Hostilities Index measures acts of religious hostility by private individuals, organizations or groups in society. This includes religion-related armed conflict or terrorism, mob or sectarian violence, harassment over attire for religious reasons, or other religion-related intimidation or abuse. The SHI includes 13 measures of social hostilities. Meanwhile, Europe and the Americas were the only regions to experience increases in median levels of social hostilities involving religion, with Europe seeing the sharpest increase. The Middle East-North Africa region continued to experience a decline in its median score, although it remained the region with the highest levels of social hostilities. 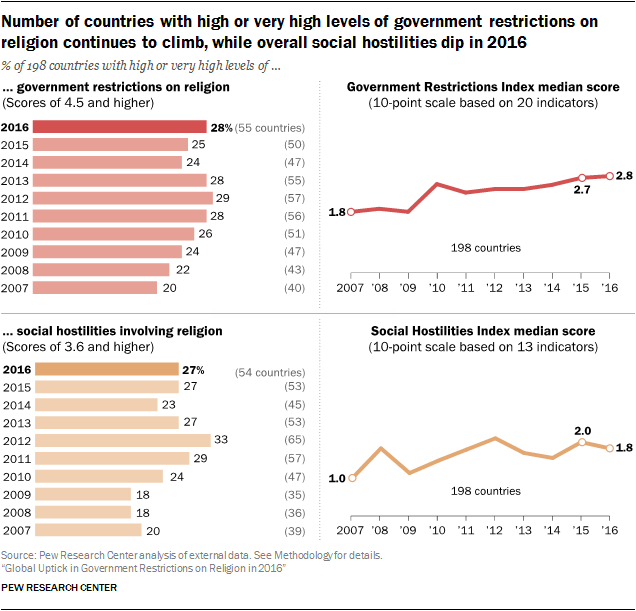 When combining measures of government restrictions and social hostilities, more than four-in-ten countries (42%) had high or very high levels of overall religious restrictions in 2016. Since some of these countries are among the world’s most populous (such as China and India), this means that a large share of the world’s population in 2016 – 83% – lived in countries with high or very high religious restrictions (up from 79% in 2015). It is important to note, however, that these restrictions and hostilities do not necessarily affect the religious groups and citizens of these countries equally, as certain groups or individuals – especially religious minorities – may be targeted more frequently by these policies and actions than others. Thus, the actual proportion of the world’s population that is affected by high levels of religious restrictions may be considerably lower than 85%. The analysis also finds that among the world’s 25 most populous countries, Egypt, Russia, India, Indonesia and Turkey had the highest overall levels of government restrictions and social hostilities in 2016. China had the highest score on the Government Restrictions Index, while India had the highest score on the Social Hostilities Index. 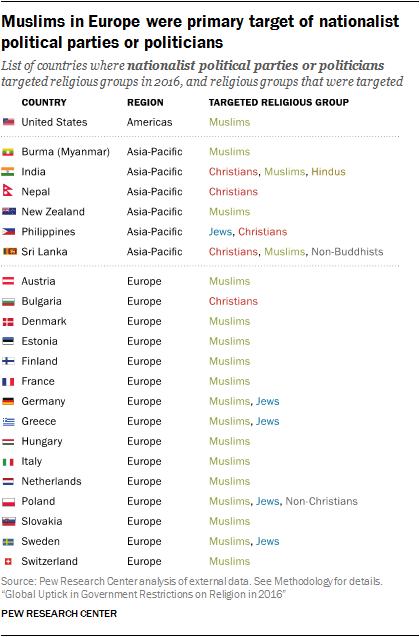 Looking at religious groups, harassment of members of the world’s two largest groups – Christians and Muslims – by governments and social groups continued to be widespread around the world, with both experiencing sharp increases in the number of countries where they were harassed in 2016. There was also a jump in the number of countries where Jews were harassed in 2016 following a small decrease in 2015. The political parties and groups identified as “nationalist” in this report were either explicitly described in sources as being nationalist, or espoused anti-immigrant or anti-minority views that result in their classification as nationalist. For more about the sources used, see Methodology. This report does not claim to be a comprehensive analysis of all nationalist activity in all countries. Rather, it focuses on interactions between nationalist groups and religious groups. It may not capture the activities of nationalist groups that targeted ethnic or racial minorities if those nationalist groups did not also target religious minorities during the period under examination (2015 and 2016).